Hollister opened their 40,000 square foot epic store at Broadway & Houston, taking up three floors, referred to as ‘Pier 1, 2 and 3’, plus a basement level swim shop called ‘Under the Pier’. You could smell the clean, masculine aroma of the SoCal cologne as soon as you enter the store. The Hollister store has the same feel as Abercrombie & Fitch (except more reasonably affordable), with male and female models waiting to greet you at the stairs and in each room. It was a bit overwhelming, with their overly friendly smile, as they stood there in their beachwear and washboard abs. From a consumer standpoint, it‘s not so easy to shop in – you may know what you are looking for but may not easily find it. Since we weren’t allowed to take pictures, I am solely going off memory here. There were multiple, dimly lit rooms made of dark wood, with a selection of t-shirts, polos and shorts for ‘Dudes’ (guys) and t-shirts, dresses, bikinis and skirts for the ‘Bettys’ (girls). I’m not sure how many different spots you could find the same merchandise, but there was a lot of ground to cover. I also remember there being a denim library with jeans galore and a room with Hollister perfumes and tiered shelves full of women’s t-shirts. As I was looking over at the t-shirts in the basement level, I did notice that many of them had the date March 19, 1922. This was when the J.M. Hollister Company was founded. Although not the greatest shopping experience, I did absolutely love the décor of the store and each of the rooms, which really encompasses Hollister’s history and character. There were so many details, including stacked vintage valises, handmade lamps, chandeliers with mini lamps, wallpaper with elephants and a three-tier clothing rack (which I would love to have in my own apt). I loved the banister ornaments, consisting of eagle, duck and turtleheads. What I found really interesting were the large window panes with a live video feed of Huntington Beach. It did take me a minute to realize that as I looked from window pane to window pane, the scene extended from people laying on the beach to jumping in the ocean and surfing. As I stared at the scene it really made me wish I was in SoCal. I don’t normally shop at Hollister, yet their XS fits me just fine. I did see several cute pieces online and in-store, so I may have to pick up a sweater or supersoft t-shirt here and there. On my way out of Hollister, I was happy to receive a gift bag including a full size (2.5 fl oz.) 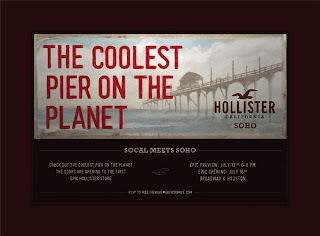 bottle of the Hollister cologne and a men’s and women’s t-shirt, with a print of Huntington Pier and “SOCAL MEETS SOHO” at the bottom. Kim- Glad they opened the Hollister in SoHo. I love the fit of the XS's, but found that the t-shirts wear out kinda fast: i.e. pilling and little holes. :( For the price point, though, they're nice to bum around in.